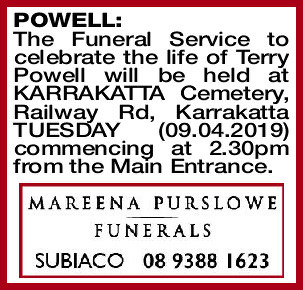 The Funeral Service to celebrate the life of Terry Powell will be held at KARRAKATTA Cemetery, Railway Rd, Karrakatta TUESDAY (09.04.2019) commencing at 2.30pm from the Main Entrance. 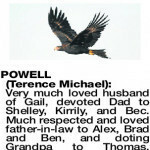 TERENCE MICHAEL Very much loved husband of Gail, devoted Dad to Shelley, Kirrily, and Bec. Much respected and loved father-in-law to Alex, Brad and Ben, and doting Grandpa to Thomas, Amelia, Nicholas, Katherine, Zara and Matthew. 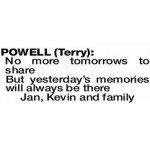 Terry cherished us all and we loved him beyond words. 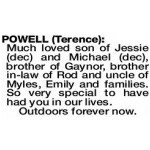 Much loved son of Jessie (dec) and Michael (dec), brother of Gaynor, brother in-law of Rod and uncle of Myles, Emily and families. So very special to have had you in our lives. 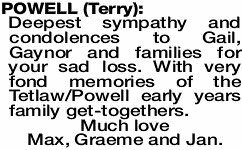 POWELL TERRY Gail, Shelley, Kirrily and Rebecca your husband/ Dad was a man of few words but had much love and compassion for all. 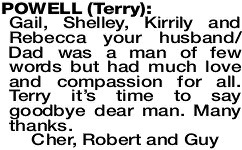 Terry it's time to say goodbye dear man. Many thanks. Our love to Gail, Shelley, Kirrily, Bec and Gaynor. Nephew of Max and Dulcie (dec), cousin of Gary, Jan Murray, Marilyn, Rex, Robyn, Clint and Trudy. A kind and gentle person who will be missed. Love and thoughts to Gail, Kirrily, Shelly, Bec and families for your sad loss. 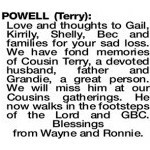 We have fond memories of Cousin Terry, a devoted husband, father and Grandie, a great person. 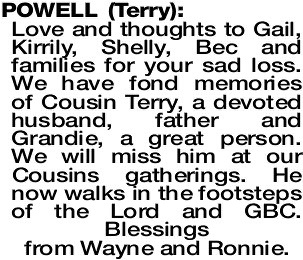 We will miss him at our Cousins gatherings. He now walks in the footsteps of the Lord and GBC. Blessings from Wayne and Ronnie. 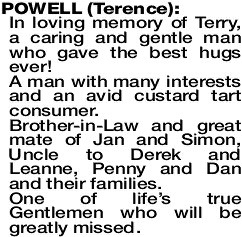 POWELL TERENCE In loving memory of Terry, a caring and gentle man who gave the best hugs ever! A man with many interests and an avid custard tart consumer. 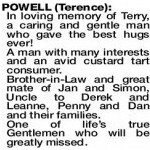 Brother-in-Law and great mate of Jan and Simon, Uncle to Derek and Leanne, Penny and Dan and their families. One of life's true Gentlemen who will be greatly missed. Deepest sympathy and condolences to Gail, Gaynor and families for your sad loss. 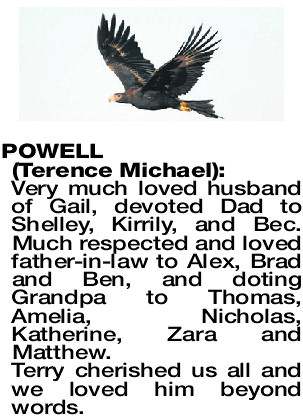 With very fond memories of the Tetlaw/Powell early years family get-togethers. Much love Max, Graeme and Jan.